This is the famous everday street food in Indonesia. You will find it everwhere especially in Java island. Once you taste it, you will never get enough!!. So why don't you try yourself at home? This recipe looks so complicated but it is actually not. 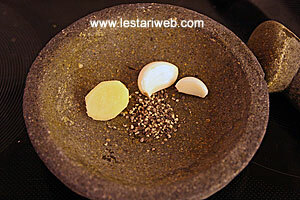 In fact..it is pretty simple & easy cooking process but the result? Hmmm....It is superb & delicious. My husband loves it!! Important Tips: Use only the original Indonesian sweet soy sauce or known as Kecap Manis. This sauce is thick, sweet and contains almost no salt. It is often used in the Indonesian kitchen, in particular for Satays. You can find Kecap Manis only in Asia shop. Though in western supermarket many varieties of "claimed to be indonesian sweet soy sauce" are available but personally I would say, those people have no idea of what kecap manis is" ;-((. Mostly those products taste really salty, worst than our salty soy sauce. These kind of product which give a bad name to people who use it in their first indonesian recipe. However experience taught me a lesson and I have found a simple trick to recognize it's originality: Just shake the bottle downside, if the sauce has a thick, almost syrupy consistency then you get it right. 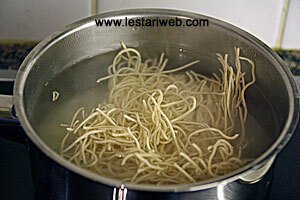 If it flows like water then never think a twice to even try, otherwise you will ruin your delicious Chicken Noodles! 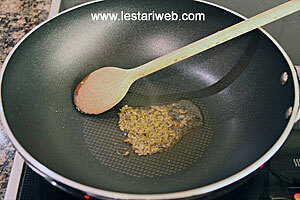 Good Luck..
Heat 1 tb oil in a frying pan, stir fry the paste over low heat until fragrant. 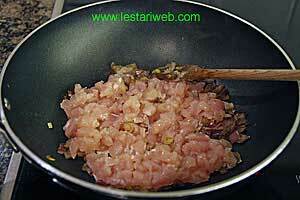 Add the chopped onion,stir-fry briefly until just wilted. 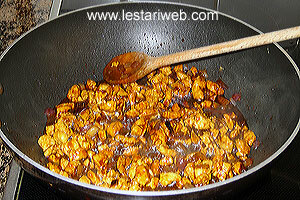 Add the chicken & continue stir-frying until the chicken's colour turns to white. 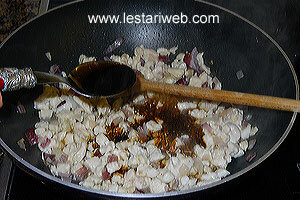 Add salty soy sauce, oyster sauce & kecap manis. Mix well. Adjust the taste. Add salt or sugar if necessary. Continue cooking over low heat until the chicken well cooked. Remove from heat. 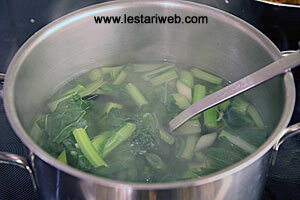 Soup: Cook the water or meat broth and bring to boil. Add the pepper, broth powder, sugar & salt. Add coy sum and spring onion and blanch just shortly until just wilted. Remove the pan from the heat to prevent overcooked. Boil noodle according to instruction until al dente. Set aside in a collander to drain. Seving Method: Put the noodle & vegetables in a serving bowl. 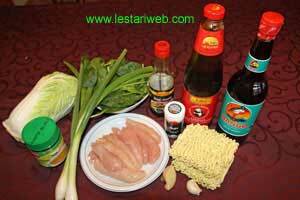 Add the chicken on top and pour in the hot soup over it. 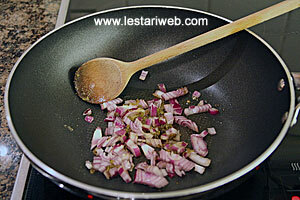 Garnish with fried shallots/onions.